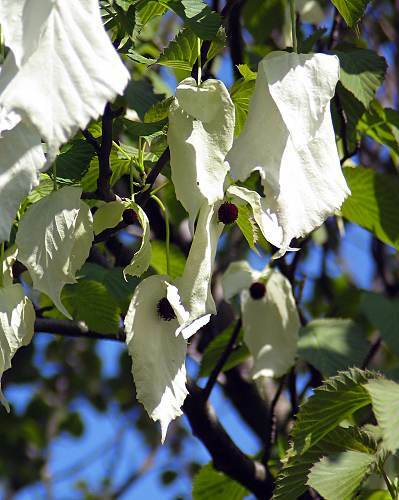 The handkerchief Tree flowers May/June, picture was taken 17th May 2004. Aptly named - the large white bracts hang down and flutter in the breeze. Also referred to as the Ghost Tree or Dove Tree. They were discovered growing in China in the 1860's by the French explorer Pere Armand David. The first tree to flower in Europe was in 1906. You can find the Tree growing at the top of Haworth Park, Rawdon Rd end.